Seems like all I’ve been talking about lately is comfort food. It is almost November after all, and although California isn’t accommodating my desire for roaring fires, fuzzy socks and thick blankets, I’m more than ready. Come on, winter…or at least fall. I got to thinking about making comfort food on the quick when Foodbuzz, partnered with Electrolux, asked for comfort food recipes to help promote their campaign to benefit the Ovarian Cancer Research Fund. I’m a big believer in doing little things that make a big difference, and here’s another chance: Click here to visit the Kelly Confidential website to check out comfort food favorites. Each time you do, Electrolux will donate $1 to the Ovarian Cancer Research Fund. That’s easy, right? And it only takes a second. Now, back to this shortcut to comfort food business. 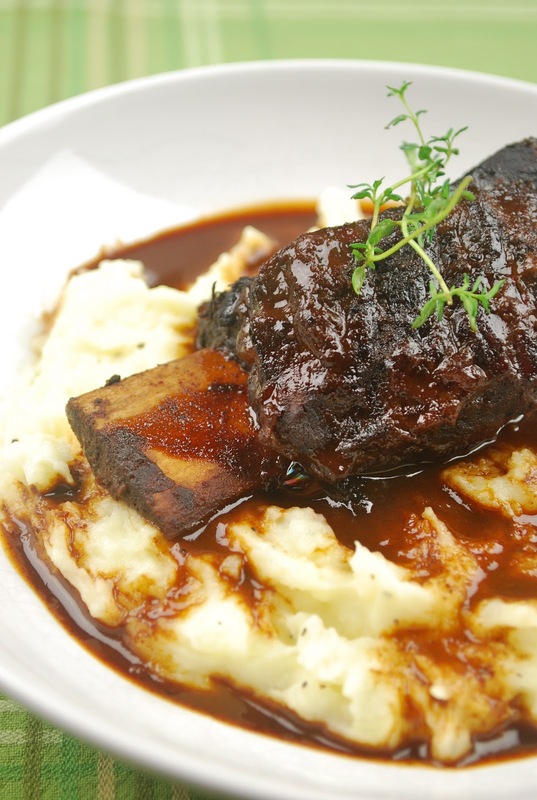 Pot roast is the first thing that comes to my mind when I think comfort food. I remember my mom making pot roast and vegetables in a plastic roasting bag in the oven. Aside from the fact that I can’t even begin to understand how that plastic didn’t melt after several hours in a very hot oven, I loved that meal. The tender meat, the roasted root vegetables, the resulting gravy; it makes my mouth water just thinking about it. For the vegetables: In a large heavy bottomed pot, melt butter over medium heat. Add all vegetables, salt and pepper. Stir to coat with butter. Cover and roast for about 20 minutes until tender, shaking the pot and stirring occasionally so vegetables do not stick on the bottom of the pot. Into the same cast iron pan, melt 1 tablespoon of butter and add garlic. Cook garlic quickly, then pour in red wine. Let simmer and reduce for about 2 minutes. Add beef broth and season with salt and pepper. Bring liquid to a simmer and let reduce about 5 minutes, until slightly thickened. When finished, whisk in remaining 1 tablespoon of butter and heat through. 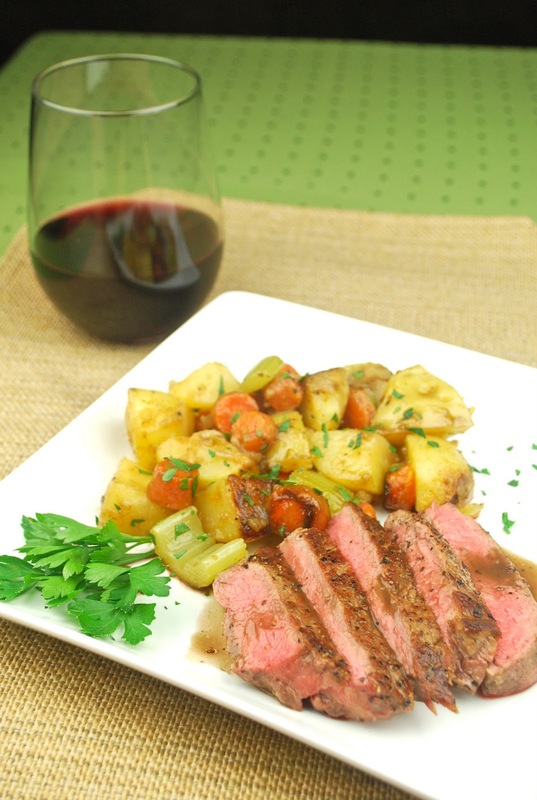 Cut steaks into thick slices and serve with vegetables and sauce. So there it is…comfort food in thirty minutes with all the components and flavors in a fraction of the time. The meat is tender, the vegetables are buttery and the “gravy” pulls it all together. And even though this meal was only actually cooking for about twenty minutes, the house still smelled fantastic. "I'm only just tolerating this since you feed me." I know, I know…it’s so typical to dress up a wiener dog as a hot dog, but you have to admit it’s pretty darn cute. If you go back to last year’s post, you’ll see that I was slightly afraid terrified of burning the house down with an unattended slow cooker. While I’m not completely over that fear, I figured that since there have been all those times when the slow cooker didn’t spontaneously combust, I was probably safe to leave the house for a few hours. However, since I could just imagine coming home to the slow cooker pushed off the counter and two very fat, happy cats covered in pork, there was the need to cat-proof, which meant the slow cooker went in the bathroom with the door closed. I’m fairly certain that the bathroom is going to smell like pulled pork until the end of time, but I suppose that’s better than some other options. So the good news is that the house didn’t burn down, the cats didn’t manage to serve themselves an afternoon snack, and I now have a pork-scented bathroom. Win, win, win. My other hang-up with the slow cooker is that I feel the need to constantly mess with the contents. I know that the very point of the appliance is that you don’t have to do that, but I can’t help myself. It’s similar to me watching someone else in the kitchen…I just have to get in there. It is impossible for me to sit back and relax while someone else cooks...in fact, it is the very opposite of relaxing for me. And with the slow cooker, I’m always poking around, stirring, basting or flipping. Since I’d made this recipe before using my standard can’t-keep-my-hands-out-of-it method, I wanted to try it again using the least possible effort and without ever even lifting the lid. Turns out these slow cookers know what they’re doing. If you’re looking for the easiest dinner ever, and have 8-10 hours to spare, this is the dish for you. The preparation took me less than ten minutes, and then I didn’t touch it until the timer went off. After that, it’s so incredibly tender that shredding it is no chore at all. Just poking at it causes the pork to fall apart. Trim the pork roast of excess fat. 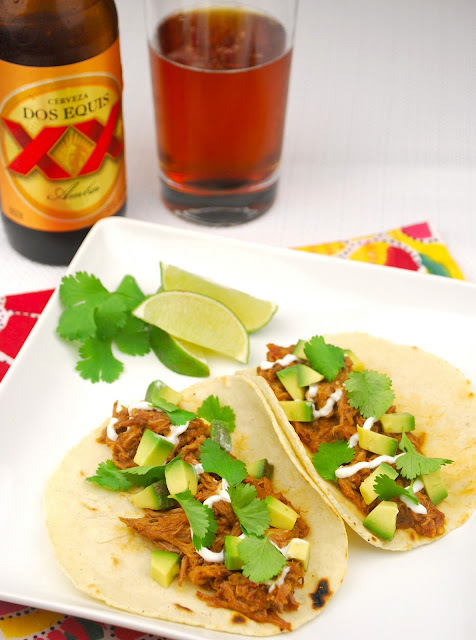 Combine the salsa, jalapenos, ground chipotle, brown sugar and beer in a large slow cooker. Place the pork roast in the salsa mixture and spoon some of the mixture on top of pork. Cover and cook on low for 8-10 hours. When pork is done, remove any bones and use two forks to pull the pork, leaving it in the salsa mixture. Warm the corn tortillas and fill with pulled pork. Add toppings as desired. *Note: You could substitute chili powder for ground chipotle pepper but you won’t get the smokiness that the chipotle offers. Sometimes it’s just a taco kind of night, isn’t it? 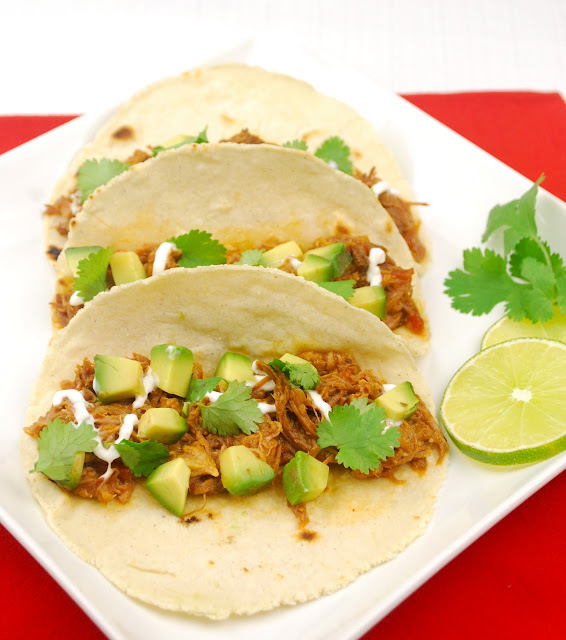 For those nights, these pulled pork tacos hit the spot perfectly. The ground chipotle gives the meat a smokiness that makes you believe it could have come from the barbecue and there’s a nice amount of heat that comes through. Best of all, the pork practically melts in your mouth. Not bad for less than ten minutes work, huh? I've finally added an "About Me" page...check it out here. I definitely have clear memories of breaded scallops and cooking the meal by myself, but whether or not it was impressive is anyone’s guess. My bet is that the scallops were probably so overcooked that they resembled rubber, but apparently everyone was nice enough not to point that out. In any case, I suppose that a pre-teen kid making that kind of dish deserves some credit for trying and at least a point or two in the “impressive” category, regardless of the outcome. Side note: there have been several instances lately where I’ve called on my parents, hoping that they could fill me in on some hazy specifics of a forgotten memory. Again, I called them to enlighten me, and in classic Dad-form was met with a guffaw and, “You’re asking me? Ask your mother…she might remember.” (I’m sure as soon as he said it he regretted it, knowing that it would go down here on record. Sorry Dad.) So I tried with Mom. She vaguely remembered “something like that happening.” Not exactly the confirmation I was looking for, so if any of this is embellished, I’m citing creative license. In the years since that meal, I think it’s safe to say I’ve grown in the kitchen. Scallops are not even a little bit intimidating, but I do think they have a certain impressiveness about them. 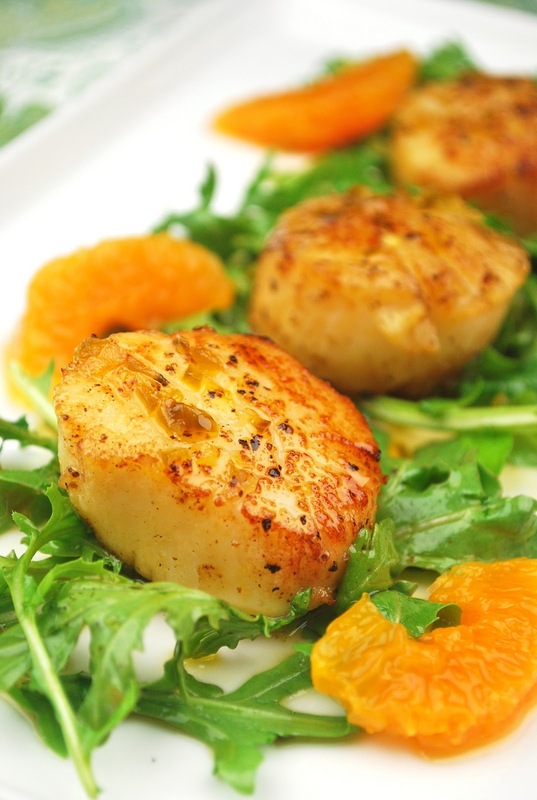 Seared scallops are just gorgeous with their brown crusts and tender middles but take only minutes to prepare. Throw them on top of a little salad, add a pretty garnish and you’re getting “wows,” guaranteed. In a small saucepan combine first 7 ingredients over medium heat. 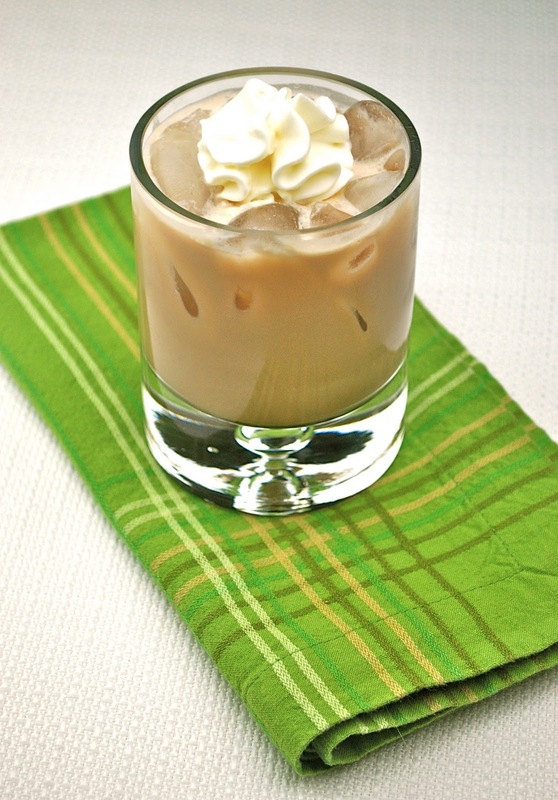 Whisk to incorporate honey. Let mixture come to a simmer. Simmer for about 15 minutes until slightly thickened, stirring occasionally. Meanwhile, prepare the scallops by removing the side muscle, if necessary. Rinse and pat dry. Coat very lightly with olive oil, then season with salt and pepper. Once glaze is reduced, heat butter and 1 tablespoon olive oil in a large pan over high heat. Sear scallops for about 1 1/2 minutes per side, until a brown crust forms. 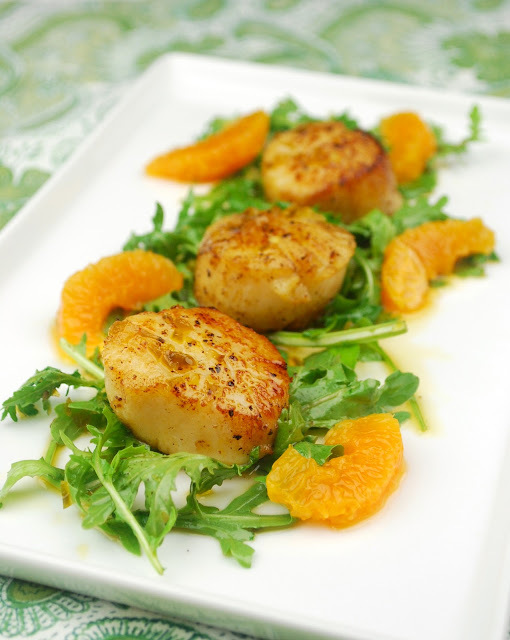 Serve scallops on a bed of arugula and spoon glaze over the top. There’s not a lot to say about this dish that you can’t see from the photos. 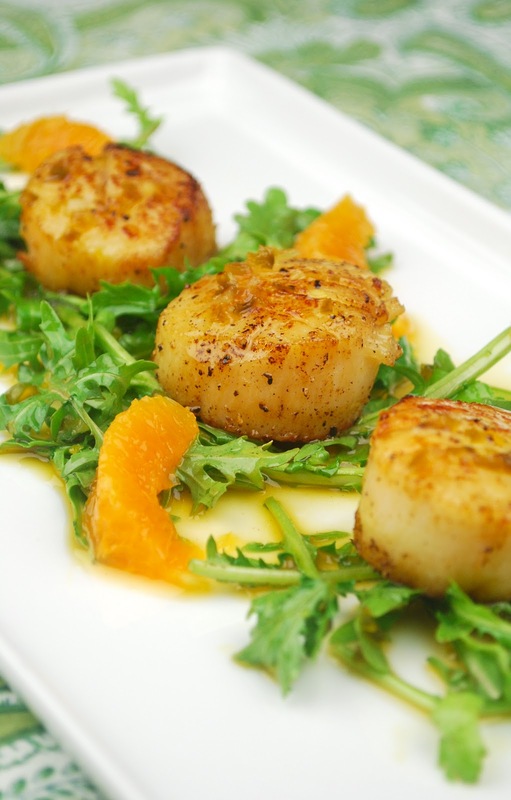 Perfectly seared, sweet and savory, with flavors of citrus, honey and spice. This is one dish I’d pull out to impress. Let me back up. Several years ago, on our first trip down to Santa Barbara, Andy and I stopped in Los Olivos to do a little wine tasting. Los Olivos plays host to many wine tasting rooms whose vineyards and wineries are spread throughout Santa Barbara County in the Santa Ynez and Santa Maria Valleys. It’s a great little town, jam-packed with tasting rooms…you could walk just a couple blocks and if you stopped at each one, you’d need a nap and a designated driver by the end. But there was one tasting room in particular that I wanted to introduce Andy to, although I had never been there myself; I’d only had the wine in restaurants. As we walked towards the tasting room, Andy casually mentioned that this would be his first official wine tasting experience. He’d been to Napa and Sonoma, but it was with clients and he hadn’t actually participated in the tastings. After his shocking statement finally registered in my brain, I was thrilled that: 1. I got to be the one to introduce this ridiculously fun activity to him, and 2. I got to be the one to introduce this ridiculously good wine to him. So into the Andrew Murray Vineyards tasting room we went…we came out with many bottles, a wine-club membership and we haven’t looked back. It is now on our “must visit” list when we head down south. Okay, you’re free to go. Please come back and let me know what you think. And if you’re in the mood, you could also check out my Spicy Tomato-Feta Dip while you’re there (Where? 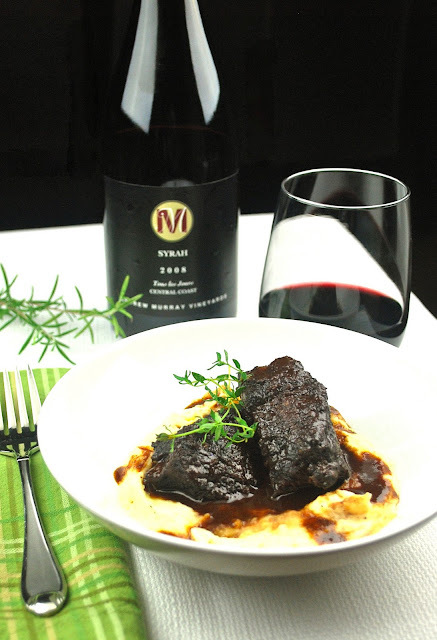 Oh, that would be on the Andrew Murray Vineyards website...), and sometime in the near future, another one of my recipes might be making an appearance. What?!? I told you I was excited!!! Disclaimer: This post was not compensated in any way. All opinions of this awesome wine are my own. Except that I had to make it myself, and I really wasn’t in the mood to cook. What I stumbled upon is probably something that all of you do all the time, and I’m just incredibly late to this party, but I’m sharing anyway in case there’s a contingent out there like me who hadn’t thought of this yet. Normally, my soup-making process is fairly labor intensive. For some reason, it becomes a huge project for me, with several pots being used and just about every blending device we own dirty. They usually come out great, and thankfully soup can be made ahead so guests are none-the-wiser to my crazed, soup-splattered kitchen. But the thought of all that effort and cleanup was too much, so I lazily threw all the heirloom tomatoes I had into a baking dish and put them in the oven to roast. What came out was the the start of the best tomato soup I’ve made yet, and all I had to do was wash a baking dish and a blender. Okay, I also might have given Andy the pouty face so he’d make the grilled cheese sandwiches…I’m a pro at that one. Cut each tomato in half and deseed. Peel shallots and cut into eighths. Peel garlic and slice in half. Put tomatoes, shallots and garlic in a glass baking dish. Season liberally with salt and pepper, and toss with just enough olive oil to coat tomatoes. Turn tomatoes cut side up. Roast in oven for about 40 minutes. Transfer contents of baking dish (including juices) into a blender and puree until on large chunks remain. Check seasonings. Note: If consistency is too thick, blend in a small amount of vegetable broth until desired consistency is reached. This was exactly the meal I wanted…the mini ham and gruyere sandwiches were perfect for dipping, and the soup was so simple but so flavorful. Each bite was bursting with ripe tomato, their flavor enhanced by the roasting process. Apparently, the moral of this story is: from laziness comes really, really good tomato soup. And if you played your cards right, also really good grilled cheese sandwiches. I could be the next Aesop with morals like this, huh? On our recent trip to Santa Barbara, I finally got to guzzle taste the Brophy Brothers “famous” Bloody Mary. For as long as we’ve been visiting Santa Barbara, I’ve heard rave reviews about their Bloody Marys, but had never tried one. See, I am a firm believer that Bloody Marys are meant to be enjoyed in the morning, definitely no later than mid-afternoon. Until this trip, the only time we had been to Brophy’s was for dinner and I just couldn’t bring myself to order one. But this time, I bellied up to the bar at 11am with my eye on the prize. Turns out, those rave reviews were spot on. This was easily the best Bloody Mary I had ever tasted. There are no extraordinary ingredients used, unless you consider copious amounts of vodka extraordinary, but the recipe is just spectacular. It has just the right amount of spice and goes down a little too easy. Unfortunately Andy had to spend his days in a conference for work, so he wasn’t able to taste this perfect concoction. And since his feet are firmly planted in the “don’t” category of loving Bloody Marys, I knew it would take some convincing to get him to try it. For some reason, he is of the belief that they just do not taste good. I can’t even really begin to comprehend such a statement, but thought that there was no way he wouldn’t like this Bloody Mary, so I watched the bartender make it and made mental notes to remake it at home. Because I didn’t want to be the only one enjoying a Sunday morning beverage, I opened the liquor cabinet to find something that Andy would love. 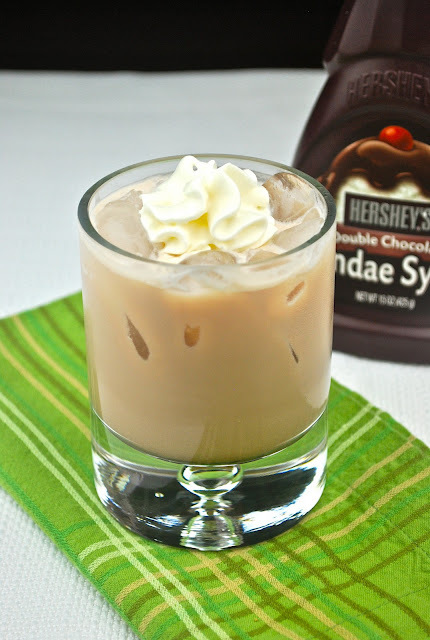 And when you want Andy to love a drink, chocolate is a safe bet. Put all ingredients into a cocktail shaker and shake until well combined. Pour into a martini glass or over ice. 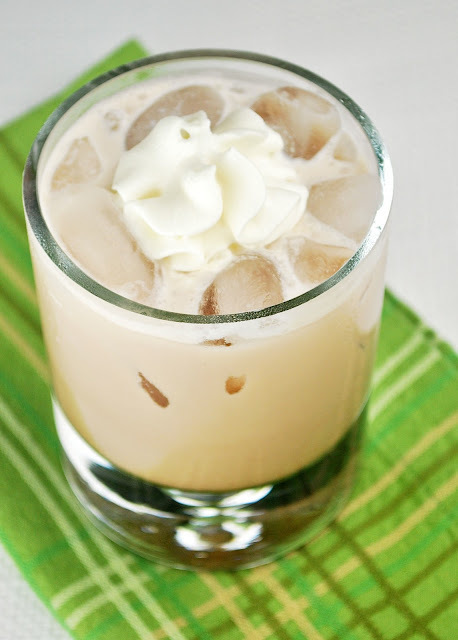 Garnish with whipped cream or swirl chocolate syrup in glass, if desired. 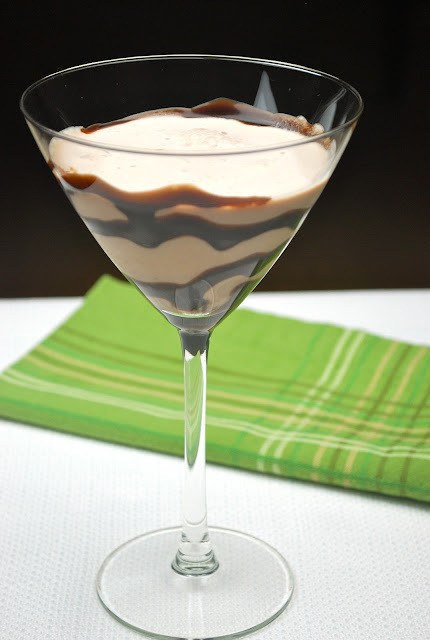 This cocktail fit the bill perfectly…chocolaty and creamy; it’s basically dessert in a glass. The subtle hint of banana gives this a little unexpected flavor that I really like. If the speed in which Andy drank his is any indication, then these were a winner. It may also be worth noting that he didn’t spit it out or feel the need to rinse his mouth after drinking it. My recreation of the Brophy Brothers Bloody Mary is not quite perfected yet, but when it is, I plan on sharing it here. In the meantime, I just have to keep testing them…it’s a rough job, but someone’s got to do it. In celebration of our birthdays this past summer, we had BIG plans. It was to be three weeks in Italy and we could easily see ourselves in bustling piazzas and cozy cafes. We would take in art, food, and wine until we were exhausted, stuffed and tipsy, then do it all over again the next day. Airfare was booked. Travel books were bought. Research was done. Excitement was building. Now I know that Sonoma for Italy probably doesn’t seem like an even trade, and obviously it’s not, but I can tell you that our Sonoma visit stands out to me as one of those days that I will always remember. Instead of sweeping coastal views, we took in gorgeous vineyards. And instead of Chianti, we drank Pinot Noir. But the good company, the conversation, the laughter and love; we have those no matter where we are. And for whatever reason, it seemed like we had them ten-fold that day. We still bemoan the fact that we weren’t able to go to Italy, but in it’s place, I have a wonderful, albeit very different, memory. And one day soon, we will get there. In the meantime, we can brush up on useful Italian phrases, learn more about Italian wine, and eat all the Italian food we want. In a large bowl, mix together first 9 ingredients and reserve. In another bowl, whisk together all vinaigrette ingredients and reserve. In a large pan, heat 3-4 tablespoons of olive oil over medium heat. When hot, toss bread cubes in pan to coat with oil. Season with pepper. Continue tossing bread until it is well-toasted, about 10-15 minutes. (Drizzle more oil as necessary to coat bread completely as it toasts.) Once done, add the bread cubes immediately to the antipasti mixture and toss with vinaigrette. Stir well to combine. Let sit for about 5 minutes to let the bread soak up the vinaigrette and soften. This dish is my attempt to meld all my favorite things from an antipasto platter into one. The salad has all the briny flavors that you’d expect, with creamy cheese, salty salami and toasted bread to soak it all up. 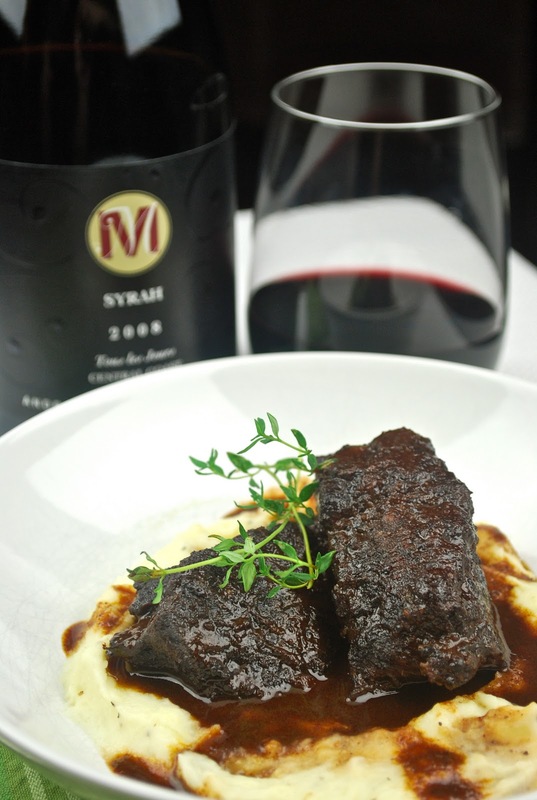 Pair it with your favorite bottle of Italian wine and imagine you’re relaxing in a villa. This project has been compensated as part of a social shopper insights study for #collectivebias. All opinions are my own. Okay, now that you’ve done your good deed for the day, let’s talk turkey! Well, not really turkey…it’s more like “let’s talk soup,” but that doesn’t have quite the same ring, does it? In any case, soup is a Thanksgiving tradition around here, along with my dad’s perfectly barbecued turkey. Oh, the turkey…injected with a salty, sweet, citrusy concoction, sage under skin, stuffed with apple and onion; this turkey is the stuff dreams are made of, if you happen to dream of crispy-skinned turkeys with the most tender meat ever. Back to the soup…every year, my dad and I launch a test kitchen to create our holiday dinner dishes. These test kitchens are highly entertaining, as each of us thinks we know better, and keep an eagle eye out for the other to make a mistake so we can point it out and laugh and laugh and laugh. Like last year, when my dad was sautéing leeks and let the whole pan burn. You remember that, don’t you Dad? Ah, good times. (He blamed it on my stove being hotter than his…uh-huh, sure.) Seriously though, I have both wonderful and hilarious memories of these sessions together and our test kitchens are as much a part of our tradition as the actual holiday meal. There are always some time-honored aspects to our dinners, like the turkey and maybe a twist on stuffing or mashed potatoes, but don’t come to us if you’re looking for candied yams, green bean casserole, or canned cranberry sauce. We like to go a bit overboard to see what we can come up with, and every year it’s a different menu. For the past several years though, we’ve started the meal with a soup. There’s been shrimp bisque, butternut squash, creamy broccoli cheese, and this year it will be carrot…spicy carrot ginger to be exact. In a large pot, heat olive oil over medium heat. Sauté shallots until soft. Add garlic and ginger and cook for another 30 seconds. Add carrots, leeks, celery, salt and pepper. Stir to combine. Cook mixture for 15-20 minutes, stirring occasionally, until carrots have started to soften. Stir in white wine, scraping bottom of pot with wooden spoon. Simmer until the wine is completely reduced. Then add the chicken broth and stir in cayenne pepper. Bring to a simmer and cover, stirring occasionally for about 30 minutes. Mixture is ready when carrots are completely soft. It never fails that when I use the immersion blender soup splatters all over me, the stove, the floor and maybe the dog (if he’s taken his post at my feet to lick up all my mess). This time I actually managed to get soup in my eye. It hurt. A lot. Thankfully, my dad wasn’t there to see this, or I would still be hearing about it. He’s probably still looking to get back at me after the leeks incident. Unless you sustain an eye injury from it, you will love this soup, which gets a slight minty flavor from the carrots, a little zing from the ginger and a lingering spice from the cayenne pepper. It’s the perfect start to a Thanksgiving meal. I created this post as part of Frigidaire's Talk Turkey Campaign. Share your own recipes and tips at Frigidaire's Make Time for Change site. For every recipe or tip that's shared, Frigidaire will donate $1 to Save The Children's U.S. Programs, which creates lasting change for children in need.